When printing Sage 300 (formerly Sage Accpac) reports to preview, the following error may occur on servers newer than Windows 2008 R2 and workstations newer than Windows 7. "Sage 300 ERP UI Container has stopped working"
The most common causes of this error are the workstation or server not having .NET 3.5 enabled, the installation was not done with an administrator account, UAC turned off, or multiple versions of the Crystal Reports runtime engine. 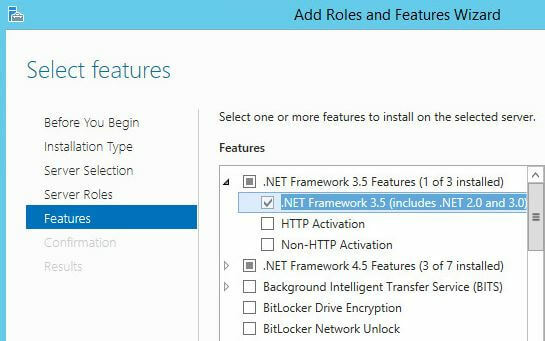 The Sage 300 Crystal runtime engine requires .NET 3.5 to be enabled which can be done by being logged onto the server or workstation as an administrator. Note: The most recent Windows 10 update appears to be removing .NET 3.5 from workstations and thus may require turning back on the feature. Sage 300 should be installed using an account that has administrative access. During the installation, it is recommended that Anti-Virus software be turned off and that user account control settings be disabled. If the software is not properly installed, the UI container error may be due to certain components not being registered. Users can trouble shoot this first by running the program regacc.exe located in the sage300runtime folder. If prompted that a4wcrinterop.dll was not registered, proceed with the following instructions to manually register a4wcrinterop.dll. Enter the command, C:\Windows\Microsoft.NET\Framework\v4.0.30319\regasm /register [sage300runtimefolder]\a4wcrinterop.dll. The default location is “C:\Program files (x86)\Sage\Sage 300 ERP\runtime\” but will CMD will need to be updated to reflect the current location of the Sage300 installation. If registering aa4wcrinterop.dll fails, confirm that the crystal runtime engine has been properly installed by navigating to the location "C:\Program Files\SAP BusinessObjects\Crystal Reports for .NET Framework 4.0\Common\SAP BusinessObjects Enterprise XI 4.0\win32_x86" (for 32bit computers) or "C:\Program Files(x86)\SAP BusinessObjects\Crystal Reports for .NET Framework 4.0\Common\SAP BusinessObjects Enterprise XI 4.0\win32_x86" (for 64 bit computers). Not being able to manually register a4wcrinterop.dll and/or missing Crystal runtime engine components could be an indication of an incomplete installation. It is then recommended to uninstall and reinstall System Manager as a local administrator. This error has also been observed when there are multiple versions of the Crystal runtime files. This may be a result of a different software application using a different Crystal runtime engine. The application using the different Crystal runtime engine would need to be uninstalled and installed on a different machine.